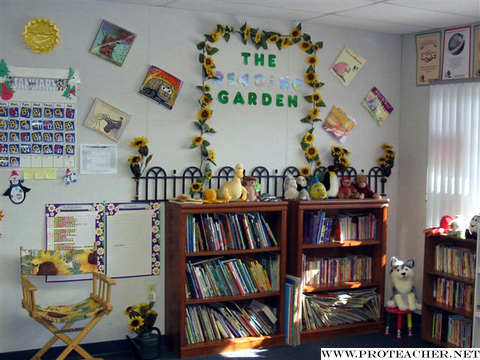 When you walk into my classroom and sit in my library, you get an instant feeling of peace and relaxation. It's called The Reading Garden and it has a sunflower archway behind a black plastic gate. The wall is adorned with book jackets and the bookshelf has stuffed animals of all kinds waiting for the kids to read to. I got the idea from a teacher magazine I was reading and I found the materials for it at The Home Depot and Michael's Craft Store. The students enjoy sitting at the table engulfed in a book or lying on the floor letting their imaginations soar. The students read for 30 minutes twice a day every day. So having a comfortable corner to relax in is highly motivational and totally enjoyable. Books are important and they love them.